Benefits of conda vs. pip | Michael Hirsch, Ph.D.
conda and pip are not merely two different ways to install Python packages. Conda can install compilers such as gfortran. Here are a few factors on where conda or pip have respective advantages. Python wheels greatly ease end-user install of libraries requiring compilation without the end-user needing a compiler. For example, high-performance Fortran, C and/or C++ code can be imported as a Python module, compiled beforehand and downloaded automatically. However, major packages like SciPy released cross-platform wheels only in late 2017 (SciPy 1.0.0). This means until 2017, easily installable, pre-compiled SciPy was not universal–some users would have to have Fortran, C and C++ compilers installed. For a large subset of Python users, compiling software libraries is not intuitive and end users disliked waiting 10 minutes for SciPy to compile itself. A core design reason behind conda is excellent conflict resolution, so I often type conda install when I want to install something complicated like Spyder. The first-class conflict resolution of conda is matched by excellent virtual environment management. 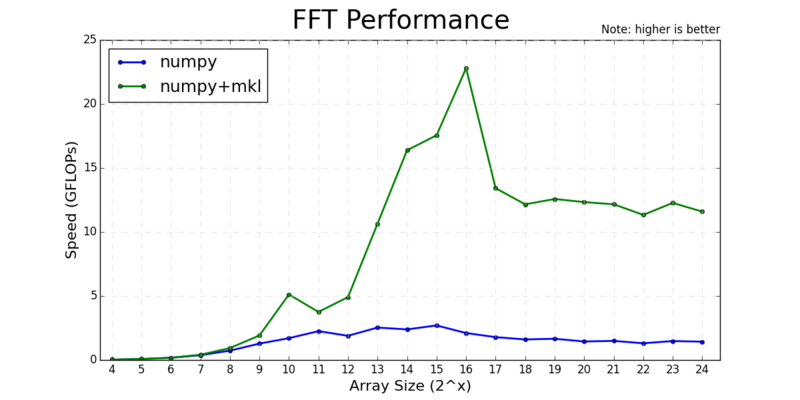 Python Intel MKL FFT benchmark.